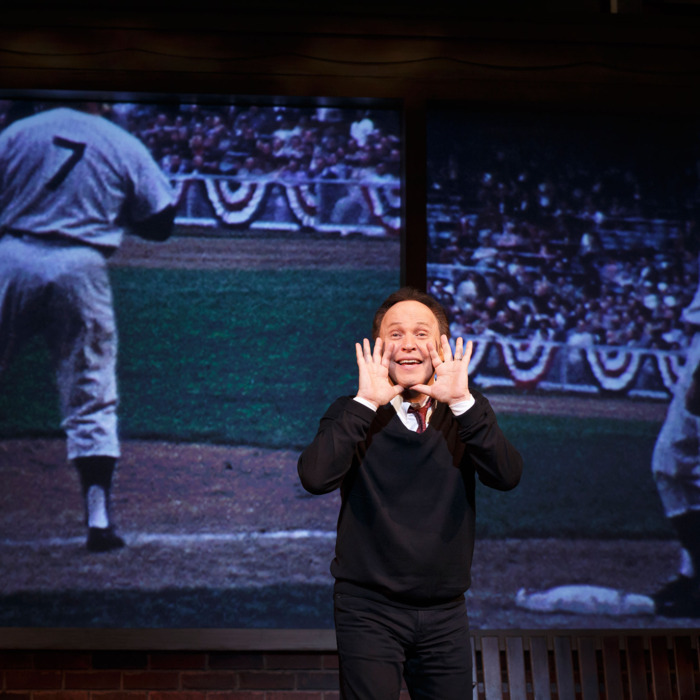 At one point in the return engagement of 700 Sundays, Billy Crystal recalls the first comedian he ever saw: an old-school tummler, circa 1958, prowling the stage at Kutsher’s “like a panther.” All these decades later, Crystal impersonates this creature, with his disowned aggression and tired shtick — “Good evening, ladies and Jews” — way too well, and not just because he quickly borrowed the material to perform for his family back home in Long Beach. Crystal, now 65, is himself a brilliant repackager of tired material, with the timing of that panther, if a humbler presentation. (He wears, instead of a tux, black jeans and a sweater.) But make no mistake, he will eat you if you let him. Mostly, the audience at the Imperial lets him. The place roars its submission if not always (I have to believe) its surprise. And perhaps that’s enough; after all, the show’s previous Broadway engagement, which ran for 31 weeks in 2004 and 2005, won Crystal a Tony award for solo performance and raked in more than $21 million. The current engagement — updated, as far as I could tell, by exactly one ad lib, about Rand Paul — stands to make more than $10 million in approximately one-third the time. Efficiency! The show, which he has toured off and on for nine years, is extremely slick and well put-together, from the dead-on replica of the brick split-level in which he grew up to the relentless alternation of hilarity and bathos. (Des McAnuff is the tick-tock director.) Regular as his grandfather’s gas, the funny coming-of-age stories are followed by sad reminiscences, most especially of his father’s death when he was 15. (Hence the show’s title: the number of Sundays they shared.) Crystal is generally convincing as himself, and it has to be said that he’s also a wonderfully eloquent mime. Among the show’s highlights, some drawn from his decades of standup, are his depiction of childbirth using just his hands and face, and a “silent movie” of a family barbecue in which his Uncle Danny goes mental. The material about the black musicians who populated his childhood — his father was a jazz promoter — is especially good, retaining its idiosyncrasy and tenderness. Not everyone gets to see his first movie, as Crystal did, sitting on Billie Holiday’s lap. One of those musicians gave five-year-old Billy, who could already capture their characteristic expressions, the nickname “Face.” (It’s the name of Crystal’s production company, too.) How apt it now seems, and not just because that face has gotten so lunar it hardly needs a spotlight. One of the annoying elements of the act — I just can’t make myself call it a play, though it’s advertised as such — is that Crystal constantly pulls faces even aside from his imitations; many convey ideas like “Aren’t I cute?” or “Can you believe I did that?” They seem meant to excuse material that was already predictable on the first Sunday: bits about circumcision (“That’s a five-skin”), the joys of Yiddish (“a combination of German and phlegm”), Aunt Sheila from Boca (“Leonard, get the goddamn car!”), and the usual mishpucha of droolers, shpritzers, kvetches, and Cossacks. Moses knows I like a good Jewish joke. But Crystal pushes the sentimentality so hard that it sometimes seems to break through the other side of the schmaltz-time continuum. It becomes its own opposite: cold and manipulative. (Of the 1957 Plymouth Belvedere that won’t start on the day after his dad dies, he says, “It knew that he was gone, and it refused to go without him.” You’re supposed to grieve for the car now?) And there are way too many morals for what’s really a gussied-up Vegas act. Wild Uncle Berns teaches young Billy that “even in your worst pain it’s still okay to laugh.” Well, fair enough, but it’s also okay to gag. 700 Sundays is at the Imperial through January 5.